The United States government has charged transnational cereal-maker Kellogg's with multiple and serious violations of federal labour law in connection with the lockout of more than 220 union workers in Memphis. In a March 27 complaint against the company, the National Labor Relations Board ruled that the company's insistence, under threat of a lockout, that the union agree to changes in a contract that was still in effect was illegal. BCTGM President David B. Durkee called the NLRB's action "The first step in validating all that the BCTGM and our locked out members have consistently said since the beginning of this tragic lock out - that the company violated the law by demanding to negotiate on subjects that are not legally proper for the Memphis negotiations. This decision also exposes the disingenuous and misleading public relations campaign Kellogg has been waging for the past five months in which it called on the Union to return to the bargaining table for negotiations. As today's Complaint alleges, Kellogg had broken the very law that governs the negotiations the company wanted the local union to resume." The union has posted videos of workers' stories from the ongoing lockout at www.kellogggreed.com from where you can also send a message to the company. Union workers were locked out on October 22 last year for rejecting the company's efforts to impose a plan under which all newly employed workers would be employed as casuals with no guaranteed hours at significantly lower pay and benefits. 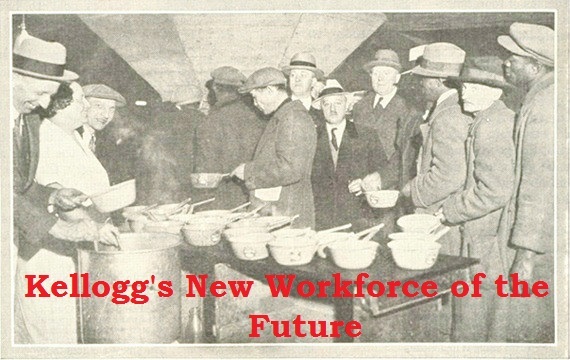 Kellogg's call this "The New Workforce of the Future". the company ultimatum was presented while the 2012 Master Agreement was still in force.